If you want to arrive from Vientiane or Luang Prabang, we can offer you various routes adding only 1 or 2 days (Luang Prabang - Vientiane) more on the schedule established. Meet our guide on arrival at Houei Xai. Pending the arrival time and the time available we might offer a small sightseeing via the road towards Viangphoukha Tea (Tea Caravan Trail). On the road, we cross many small villages, we can stop according to your desires till we reach Viangphoukha. If time permits a small village tour will be organised. Start of our six days trek from Vieng Phoukha to Xieng Kok. This trekking is exceptional, you wil encounter wonderfull sightseeing such as wildlife crossings and a rich experience from living with local communities. You will pass through some of the most beautiful primary (and secondary) forests in Asia, home to lush vegetation in natural harmony. Many animals (eg, leopards, gibbons, gaur, sambar deer, pigs woods, many bird species, etc. .) can be seen among the communities lifes Akha, Khmu, Hmong and Tai Lu tribes. Every night, we stop at a traditional village where different people will be happy to share some of their habits with you the visiting "adventurers". Meals at nights are taken together with the locals. Our trek will be led by your guide, the village head and porters (who functions as a walker). The village chief and the holders who lives in the area know perfectly well their forest. They were trained to control human impacts on it, and will explain the practices to respect. After 6 days of walking and discovery, we reach Xieng Kok an isolated village near the Burmese border. 5 to 6 hours of walking each day on average. Departure from Xieng Kok driving towards Meuang Sing (around 4 hours). On the way we will do many stops to discover the minority villages and to make some small walks (forests, rivers, waterfalls, etc...). Meuang Sing will be reached in the late afternoon. After breakfast, drive towards Luang Namtha. We will stop anytime when you want to enjoy local life in this remote corner. After arrival in Luang Namtha, we will take a canoe to explore more this area which is so exotic, quiet and relaxing. After Breakfast you will visit Luang Namtha : museum, local temples, waterfalls, markets. Depart of Luang Namtha heading to Ban Na Maw. Overnight in Ban Na Maw. During this three days trekking, we will cross a beautiful dense forest. Be fascinated by the intertwined life of forest with its colorful animals, birds and an impressive fauna and flora. We will have the chance to meet and monitor life along several rivers. We will also come across many Laotien tribes such as the Akha, Khmu, Thai Dam, Mien, etc. All our evenings and nights are spent in a village of one or another of these communities, sharing unforgettable encounters with the locals will be the main goal. Small lunch and then visit Ban Boun Tai. During this 7 hour cruise, enjoy the charms of one of the most fascinating river in the world: life of fishermen's, villages bordering the Mekong, discovery of fauna and flora, well deserved rest on the deck, etc. 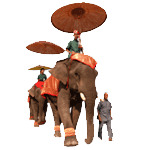 For example we can extend the length of the circuit or by combining with other existing circuit, or by offering other benefits (elephant trekking around Luang Prabang or deeper explorations of Laos by going further south, etc...). For this circuit, starting price is , based on 4 people in standard accommodations.